Wildlife lovers and nature enthusiasts rejoice! This year, The Great Canadian Travel Company is offering you the chance to view the polar bears of Churchill, Manitoba up close in their own habitat during a four-day, three-night trip of a lifetime. Each fall, for about seven weeks, polar bears crowd the western shore of Hudson Bay, waiting for sea ice to form. When it does, they spend the winter hunting seals. 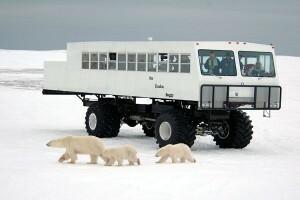 From the safety of a giant tundra vehicle, guests will be able to capture the first sightings of the bears. Equipped with a washroom and heated for comfort, the ten-foot-diameter tires of the vehicle allow access onto the tundra. On board are an experienced naturalist guide and a driver who knows the best spots to take pictures of the cute, yet powerful animals.